As a knitter there are times that we know exactly what we want to knit. We know the exact pattern, yarn, needles, gauge, and every little detail that will go into that project. That yarn for that project may be in stash, or it could arrive one day at your local yarn shop. When you see it you know exactly what it is going to be and how much you want it. Or sometimes you just know what something is going to be even without seeing or touching it first. 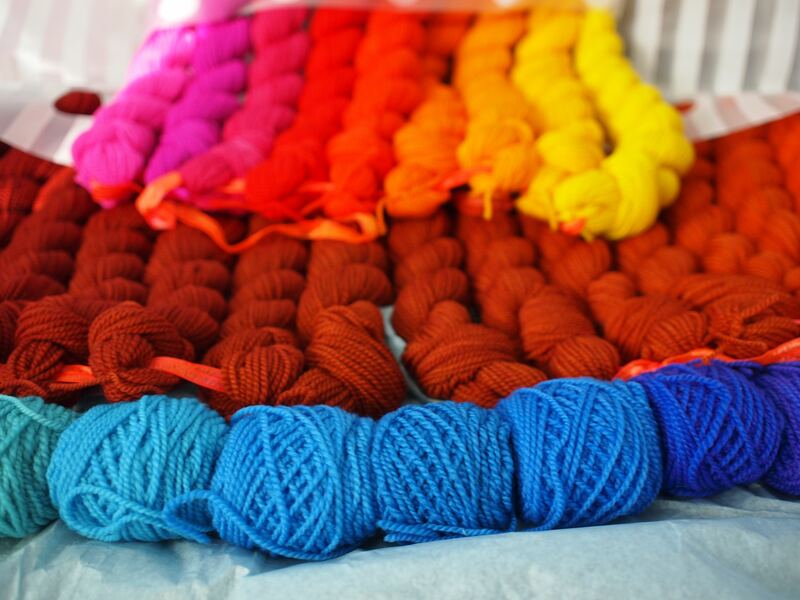 As a designer I have to look at a yarn, it’s color, texture, and have it go through my mind. It has to take on a journey from start to finish to know exactly what it’s going to be, look like, feel like, and make me want to start it. 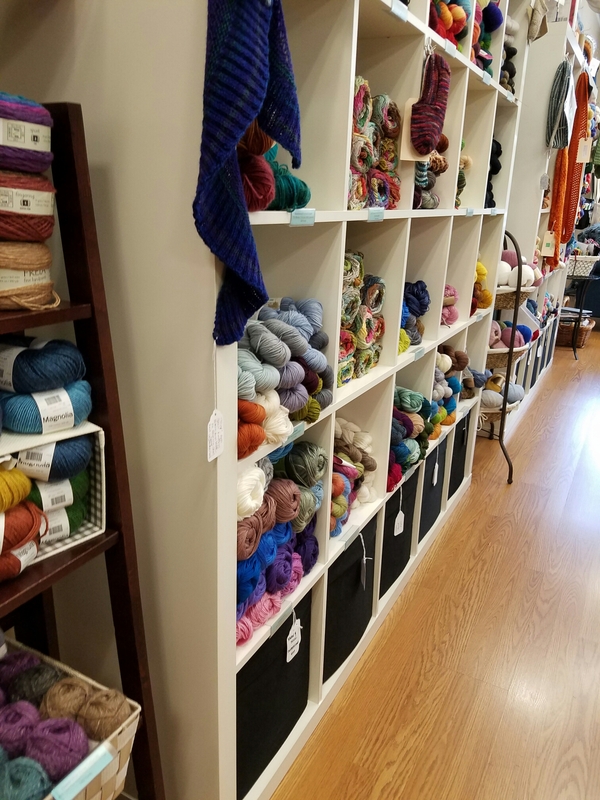 I went up to another local yarn shop on Saturday, looking for a yarn I needed for a design, part of a series I’m working on. I won’t give you any details on what that series is, the yarn I purchased, or anything. But I will say that I had to make decisions right then and there in the shop, is that amount of yarn going to be enough, is this garment going to have this attribute or not. Stitch pattern, size, all of that and a myriad of other decisions made within a few minutes. So I picked up the yarn, brought it home and now it taunts me a little bit. I’m really surprised that I’m sticking to the whole monogamous knitting so well. This is the second project that I’m going to cast on, the first, well that’s something I’ll have to make you all wait to find out about. For now heres a picture inside of the shop. I have to finish my Adonis Pullover, just about half way to the underarms. Everything is going by so quickly here, that happens I suppose when you are as busy as I am. It feels like yesterday was still summer and school was just about to start again. It’s now nearing the end of November and time has slipped away from me. My knitting has had something like that happen to it as well. If you haven’t seen my last post, I was knitting the newest Stephen West mystery and I was starting clue 4 and really looked at my colors against the pictures he posted of his. I really didn’t like how my colors were trying so hard not to look bad together, but they failed. I still haven’t ripped it out yet, but it’s on the list of things that I need to do. It’s going to have a lot of knots in all 4 skeins, but that’s the price I pay for not stopping sooner. On a happier note, I have been pulling out some of the design yarn. No I don’t have any hints for anyone, but I’m able to get some of my designs up and running again. Currently swatches are all that I have going on some of them, but that’s the start I need to get me putting up more designs. Some of these I can’t wait for you all to see when they’re done. I have models lined up for some of them and the one I’m currently working on swatching, I can’t wait for the final product. I think that it will be quite spectacular, if I do say so myself. I promised pictures of something that I purchased didn’t I? Sari is such an amazing pattern, ever since I saw it I thought it was beautiful, but when someone at my LYS brought hers in (done in miss babs) I knew I had to make it. But I had to find the right yarn to knit this spectacular design in. I saw on the pattern page that it was made with Color Shift Shift Yarn and I just had to take a look at the yarn. I went over to their Etsy shop and I knew that was the only yarn that I wanted to make Sari out of. Two of my friends at the LYS bought their own custom kits from the shop, but I wasn’t sure what I wanted to do. I decided I wanted the colors as it came, red is one of my favorite colors. I placed my order, thought I wouldn’t see it for a little bit, since she does say in the The kit’s description that it will take 6-8 weeks to dye and ship. I don’t know what happened, but about a week after my order I got the confirmation that it was being shipped. It arrived and what the box contained I thought I was prepared for. The yarn was stunning, beautifully packaged, and the smallest details were thought of. There are no words to describe the beauty that the boxed held, but maybe a picture can help with that. You can tell how much the dyer cares about what she does and the talent she has in order to dye colors that are so perfect. The shift from one color bridge to the other, is just about unnoticeable, there is no abrupt jog, just a smooth transition. Each bridge and color progression is labeled to what colors they contain, yardage, etc. There’s even a page that is included with some information from the dyer, care instructions, and all. I have not seen this level of dedication and attention to detail in yarn, it’s incredible. I told the dyer this and that I want to design something with her yarn in the future, I just need to figure out what to do in order to do justice to her yarn. For now I will be knitting that swatch, with the kit sitting close to me, wanting me to start it. That will have to wait till I’m done with school for the semester, and then a knit against will begin. The last month has been kind of insane, I didn’t realize how much time had gone by. I am still alive, busy, and chugging down coffee like its water. It’s when you get to that point in the semester you know it’s coming to a close, only 3 weeks and then finals and I will be done with this semester. I will be glad when I have a reprieve from the crazy schedule I have been sustaining. Which I’m guessing is in part due to the amount of coffee I’m drinking. But that’s besides the point, which reminds me I should have another cup right now. Have to study, write a paper, finish a coding assignment, and so much more. Knitting wise, I have been knitting all that much, just here and there when I can. I recently started the new west knits mystery knit along. I liked the first clue, the second and third I’m on the fence about but I guess I’ll have to see if somehow it’s pulled together on the last clue. The colors I chose were all from stash. This is a good thing due to the stash getting a little bigger then I wanted it to be. I’m using some of the Tosh stash, some more “vintage” then the others. That and the colors that I chose are pretty bright, which is very me in some ways. But in some ways, it is not me at all. I choose Dalia, Tomato, Maple Lear, and Norway Spruce. I’m curious to see what all of the colors will look like once the final clue comes in and wraps everything up (hopefully). I received something really pretty in the mail, which will wait till next time. I have to take good photos of it to do the product justice. For now I don’t have much, since most of my time allocation is for school and work and not for much fun things. Posts will be coming as much as I can. And I’m goi to end it on this note, I finished the 3rd clue on the mystery, saw what the original looked like and I like it, with more subtle colors, but you loose all of that texture work. I’m not happy with the my color choices at all, or the pattern for that matter. I’m not even going to take pictures of it, it’s going into the frog pond, rip rip rip. I’m going to cast on a new design now.